Registrations for workshops requires a yearly membership which covers administration costs. You will receive email updates on our latest offerings. General membership is $30. Student and senior memberships are $25. Family memberships are $60. Registrations can be accomplished online with payment button under each class or you can mail in a check with the registration form here (PDF Registration Form). Deposit/Cancellation Policy at bottom. This study will be on the traditional focus of building knowledge of the human anatomy. 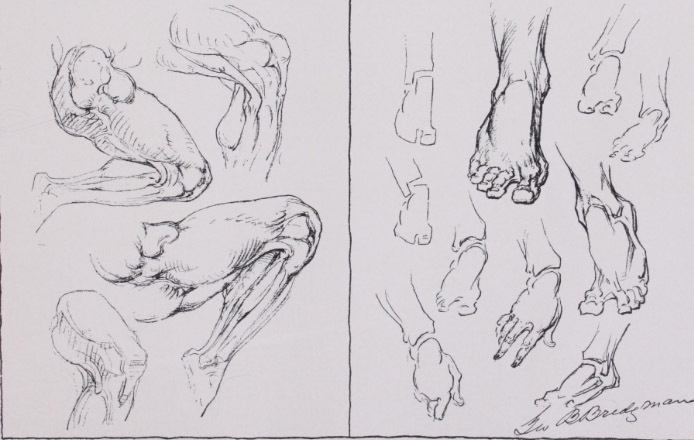 Bones, muscles, origins/insertions, functions, and other aspects of anatomy will be discussed. 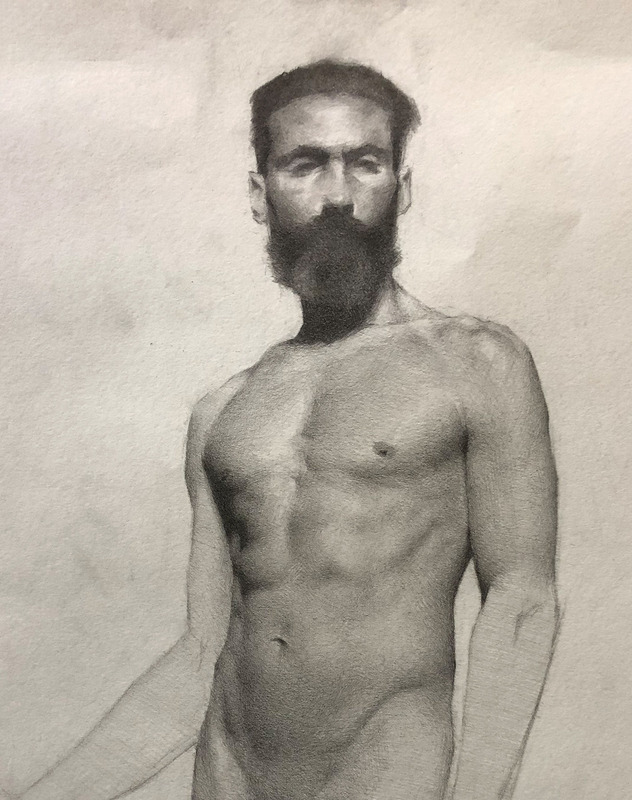 The Anatomy Study will focus on parts of the anatomy with a live model, so students can apply the academic knowledge to an actual figure and relate the knowledge to the specific process of drawing. Sessions include lectures, male/female models Subjects include; legs and feet, shoulders, arms and hands, shoulders, head/veins. Offered as 5 hours each Sat. Models - (male and female on different days) fees included. If you paint a snow scene, your viewer should shiver. A beach scene should let the viewer feel the warmth of the sun, and hear the seagulls. 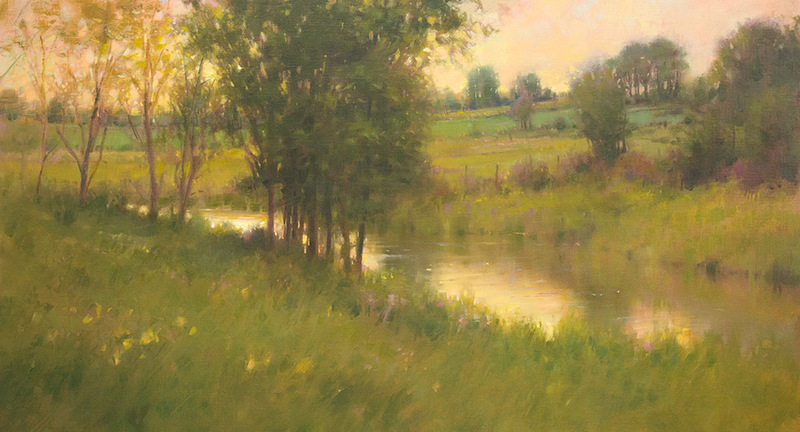 To paint emotional landscapes, it's important to study with a master landscape artist who has conquered the nuances of light, the energy of the foliage, and the perfect balance of color — to create an atmosphere where you can tell the temperature just by looking at the scene. John MacDonald is careful to emphasize that there are no secrets or shortcuts provided in this workshop. Instead, John will offer a fresh approach by giving you a deeper understanding of the entire process to create an important and visually stunning work. Become familiar with oil paint and be able to match any color you'd like in this thorough color mixing class. With targeted exercises, you'll learn to mix and match colors from life and photos with realistic results. We will first learn the traditional limited 4-color palette, and then an extended 9-color palette to pick up on subtleties of color. There is a demo on hue/value/chroma and how to understand the connection between that and the color wheel. 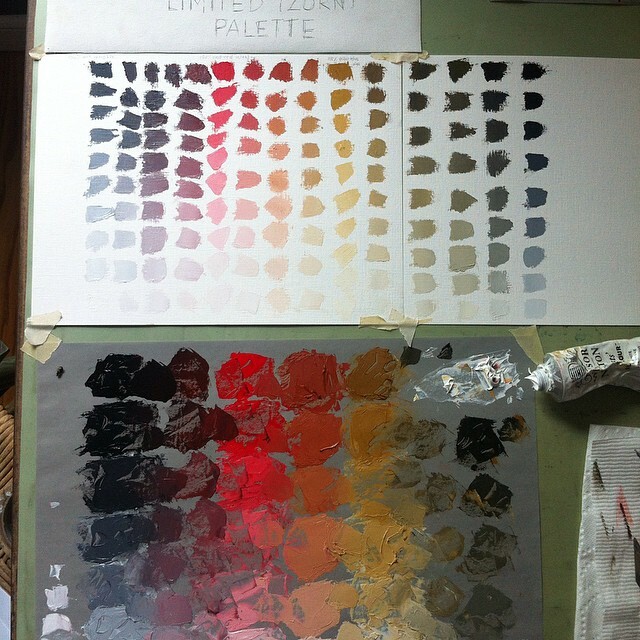 Learn how to mix and match colors exactly, how to lay out your palette for optimal use, and become a master over your paints through targeted exercises. In this 5 day workshop, participants will develop a fully rendered portrait painting done in the indirect painting method. Each step of the indirect process – drawing, transfer, underpainting, and final painting – will begin with a demonstration by Katie, and proceed to thorough individual critiques. 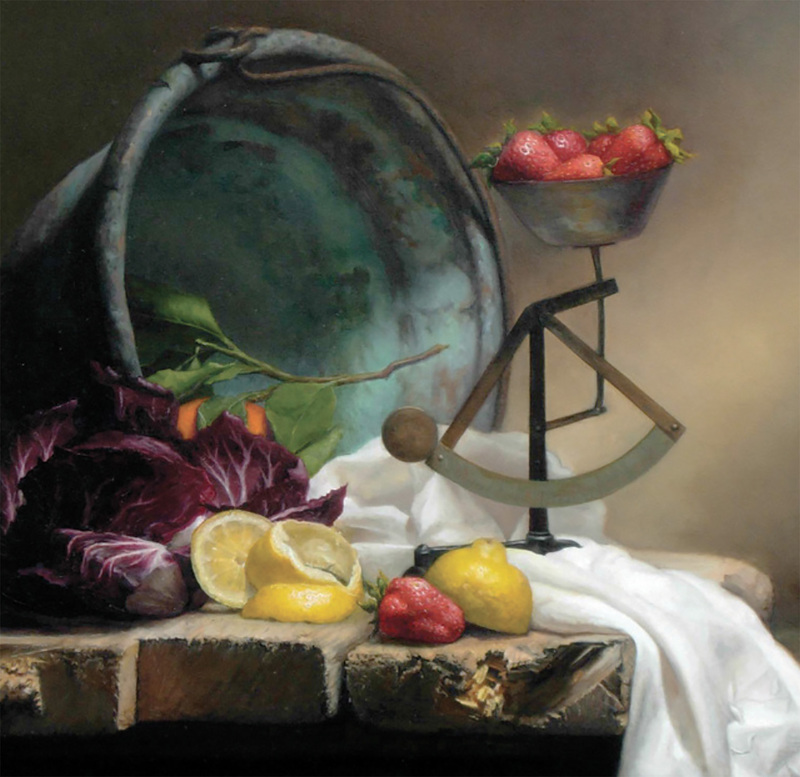 Learn how to paint a realistic still-life in a supportive, academic, inspiring environment. The goal of the course is to introduce artists to the representational painting world, understand the observational painting process, and come away with a beautiful painting. Working from life in the sight-size method (no gridding, tracing, or projecting- only drawing from life), students will learn how to overcome the challenges of painting a variety of objects, including cloth, metal, wood, glass, or perishables, and how to push past visual limits to extend the illusion of depth and realism. We explore line, shape, form, color, texture, edges, composition, and a logical process that makes creating this type of work streamlined and obtainable. Relevant short demonstrations will be given each day, and as students work on their painting they will be guided and critiqued suited to their individual pace and needs. Besides watching, painting, lectures, and critiques, Christina's much-loved handouts further enhance the learning experience. You will come away knowing how to confidently paint a still life from start to finish, including how to use the sight-size method, draw and paint with accuracy, mix and match exact colors, use mediums in layers, deal with sinking-in, care for palettes and brushes, set up a still life, set up studio lighting, promote the archival nature of your painting, varnish, and more. Gain confidence no matter your prior experience, and feel satisfied knowing that everything learned here will translate well into drawing or painting any subject from life. If you are taking the class for the second time, you have the option to learn how to paint red drapery. It is a completely different glazing technique. If you are taking the class for a second time and don’t want to paint red drapery, you have the option to set up your own still life with your own objects. Course outline and material list upon request. Over the four days, students will strengthen their drawing skills and anatomical knowledge through drawing the figure from life. The class will begin with a series of short poses leading to one long pose for the four day workshop. The instructor will guide the participants through the drawing process with demonstrations and individual critiques. The process begins with the block-in stage, which aims to capture the dynamic gesture through accurate proportion, shape design and structural anatomy. After the block-in, students will move into modeling form through an understanding of the light source. Comparative measurement, structural anatomy, materials, light and form will be discussed. Artists of all skill levels are encouraged to join. Model fee included. Deposits are required for all classes and workshops in the amount of half the tuition to secure limited spots. Full payment is due two weeks before the start of the session. All cancellations must be made 2 weeks before the start of a class or workshop. We are not responsible for issuing refunds, credits or transfers for classes/workshops missed due to illness, emergencies or events beyond our control. If a workshop is cancelled by us, all money will be promptly refunded.